RedCoach steals the spotlight. Redcoach is a luxury motor coach company and offers an affordable way to travel by bus in Florida. They drive all throughout the state and have stops in many of the major cities. They also offer a referral program to their riders. RedCoach began in May 2010. The goal was to offer comfortable and convenient travel at an affordable price. The bus is no ordinary bus, but rather a luxury coach that offers everything you need to have a truly unique experience. The ride is extra comfortable, as passengers get to enjoy big and fully reclined armchairs, flat screens, WIFI, toilets, and tables for computers. To accommodate customers and their safety, they monitor their vehicles 24/7 with GPS technology and security cameras. Want to find out more about where they go? Check it out here. The RedCoach Referral Program is appealing to any traveler because they provide a great incentive to both the customer and the referral. 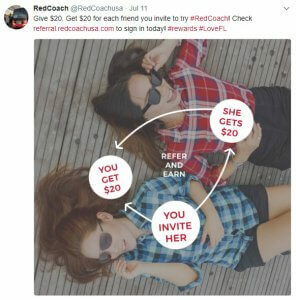 Referrers earn $20 off travel if they’re able to get their friends try RedCoach. It’s a give $20, get $20 sort of deal. You’ll spot the program on the homepage of their website. This makes it super easy for everyone to sign up and refer. The headline is nice, catchy, and professional. It allows the customer to quickly see what the program is, and what they will earn for participating. RedCoach uses a simple image to get the point across. Plus it illustrates that referrals can easily be sent by your smartphone, which makes it straightforward for users. RedCoach makes it painless for customers to share. And, there are plenty of sharing options, including email, social, you name it. They have also conveniently pre-filled the social media and email messages to help the customer out. Of course, the customer also has the option to add their own message if that’s what they prefer to do. RedCoach clearly understands the importance of referral program promotion because they make it visible on a variety of channels. For instance, it’s on their main page of their website and throughout their social media pages. This way all their customers and potential customers can see it and easily join in on the action. Promoting via social media is a relatively effortless way to reach customers. Many of them are already on social media, so the program will naturally be more accessible. Not only does RedCoach mention the benefits, they use fun images to help get the point across. When something is visually appealing it helps get people’s attention. Good job RedCoach! 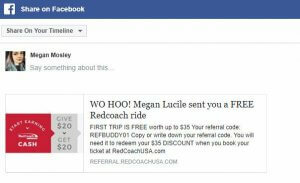 The RedCoach referral program is a dual-side incentive program, rewarding both the referrer and referral. With the incentive being a generous $20 reward, this often equates to the customer catching a free ride. Overall, the program is simple and straightforward, which fits their on-the-go customers perfectly.